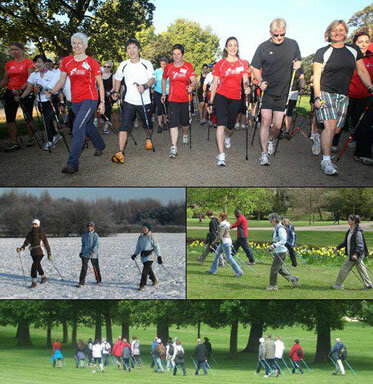 These sessions take place all year round and are led by the Midlands Nordic Walking Instructors. They are a mix of fun formats with steady endurance, fitness and themed walks. Instructors also enjoy passing on the latest advice on health and fitness to give you the best chance of meeting your goals. You must have already been taught how to Nordic Walk by a qualified instructor before joining one of these sessions. Please contact us if you feel you would benefit from a refresh on technique before joining in. Instructors will provide Nordic Walking poles. Contact us to book your first session and be sent details of the current meeting place. Class fee is £6 payable on the day. As well as all-year round regular Nordic Walks, the instructors arrange several feature walks to new locations for special occasions such as INWA World Nordic Walking day. These always feature a pub or cafe stop. Watch Catherine teach Kyle Pentelow from BBC East Midlands Today. Kylie did very well considering this was her first time Nordic Walking and it had snowed heavily a couple of days beforehand.